The importance of different SAP transactions/business processes (BP) widens significantly and accommodates the 80:20 rule: customers have 20% most relevant transactions/BPs which they do 80% of their business with. Obviously, these transactions/BPs need to always work, thus justifying priority in testing budget and schedule. 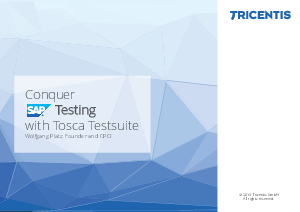 Download now to find out how Tosca Testsuite offers the most comprehensive technology support: in addition to the SAP interfaces Tosca Testsuite can automate more than 30 different UI and protocol technologies.